Alaska Fly Fishing for Northern Pike in the Matsu Valley on Flathorn Lake. Mike Kingsley shows off a scrappy northern pike taken from Flathorn Lake on a summer expedition to this remote location that is accessible only by boat or floatplane. 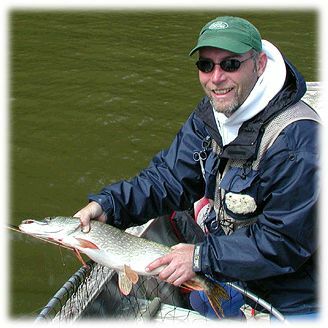 Much of the time fly fishing for pike involves sight fishing techniques as the fish tend to hold in relatively shallow waters where weed beds are available to hide their presence from unsuspecting prey. Baitfish and other "meaty" fly patterns such as mice, shrews, leeches, and frogs are all successful in enticing the savage strike from a northern. There is nothing more exciting than retrieving a fly near the surface and seeing multiple V wakes streaking towards your offering. One could compare the experience to fishing the shallow saltwater flats in the tropics for barracuda, bonefish or pompano. The tackle, techniques, and personal gear are all the same, including the 12 foot push pole for working the boat quietly through the target zones. An electric trolling motor is also quite effective and even more maneuverable.